Member of the renowned Kilian dynasty of artists and engravers of Augsburg. Son of Georg Kilian [1683-1745]. 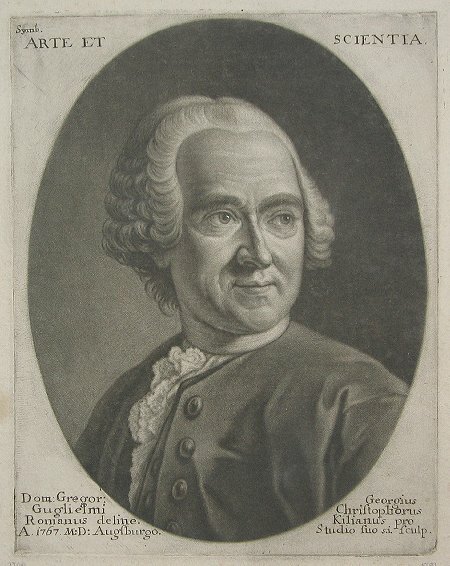 Georg Christoph followed an apprenticeship with his father with the traditional years of travel, visiting Nuremberg and Hungary and working for a period in Vienna, where he studied the art of the Old Masters. He returned to Augsburg and established himself there, enjoying a high reputation in the literary and artistic circles of his time. He characterised the prevailing humanist ideal, working both as a talented artist and as an historian, art collector and biographer of other artists. Apart from his renowned natural history collection, Kilian had a well-chosen art library and above all a comprehensive graphics collection, comprising engravings, woodcarvings and drawings. He collected in particular the works of his own family. He himself also engraved portraits of his ancestors and family for the collection. The latter, bound in six volumes, now forms an important part of the Augsburg Staats- & Stadtbibliothek, to which he bequeathed it, along with the majority of his collection of 16000 engravings & prints in 1781. His cartographic works included the Supplement to the Atlas Curieux ; Kleiner Atlas , Kriegs Atlas , Theat. Guerre Allemagne - 61 maps , America Septentrionalis .